Typewritten Letter Signed, one and one-quarter pages, quarto, Washington, D.C., March 19, 1946. On White House stationery, to Generalissimo Chiang Kai-shek, president of the National Republic of China in Chungking, China. With the original envelope. “You will recall that your Government has on several occasions through Dr. T. V. Soong expressed the desire to obtain the services of an American expert in budgetary and financial administration. I am happy to inform you that at my request Mr. John B. Blandford, Jr., has agreed to go to China to serve in that capacity. He is well qualified to perform those functions, having held such responsible posts in the United States Government as those of Assistant Director of the Bureau of the Budget and Administrator of the National Housing Agency. “Mr. Blandford goes to China with my full confidence and with my best wishes for success in the mission he is undertaking. I am sure that he can offer constructive assistance in the solution of the manifold budgetary and general administrative problems which beset your country in consequence of the long and costly struggle against Japan. 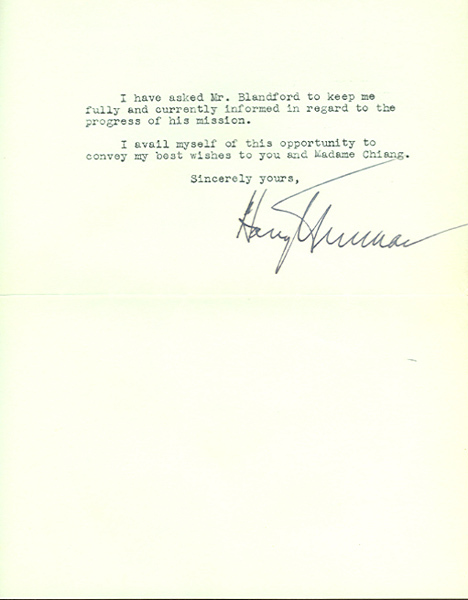 I have asked Mr. Blandford to keep me fully and currently informed in regard to the progress of his mission. I avail myself of this opportunity to convey my best wishes to you and Madame Chiang. Interesting post-war letter written at a time when Harry S Truman’s United States was encouraging peace talks between Chiang’s weakened Nationalist government and Mao’s Communist forces. 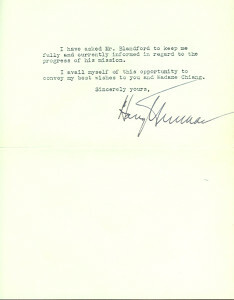 Due to widespread concerns about corruption in Chiang’s government and widespread sympathy for the Communists, Harry S Truman suspended aid to the Nationalists for much of 1946 to 1948. Though Chiang had achieved status abroad as a world leader, his government was deteriorating from within as a result of corruption and inflation.